The Dr. 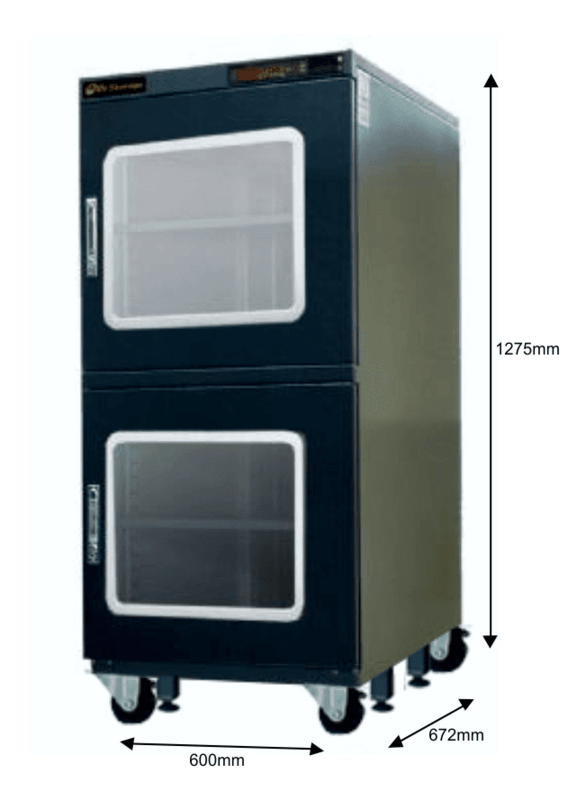 Storage QDB 400 Series of Smart Nitrogen Dry Cabinets are designed to control the filling of user supplied dry air into the cabinet, so the desired relative humidity in the cabinet can be reached. The QDB Smart Nitrogen Cabinet is adjustable from 1%~50%RH. The dry air can be nitrogen, CO2 or inert gas. Nitrogen Gas is the most classic and common choice of dry air. The use of Nitrogen as a dry air protects components or samples sensitive to the level of ambient oxygen in the atmosphere and subsequent oxidization. This is the ideal cabinet when that is of a concern. Due to the nature of Nitrogen as a dry air, the QDB Smart Nitrogen Dry Cabinets have a faster recovery rate than a desiccant dry cabinet. All QDB Dry Boxes come complete with a QDN filling module, digital display, RS-232 port, humidity manager software, antistatic package, locking doors, adjustable shelves, alarm, conductive wheels (except for the QDB-200), calibration reminder, and are black in color. This cabinet provides optimal protection for (but is not limited to) electronic components such as IC’s and PCBs . QDB Smart Nitrogen Cabinets are also available in Stainless steel (QDB-600 & QDB-1200) upon special request and is the ideal design of cabinet for storing semi-conductors.